"After my first two thru-hikes, I had a pretty good idea of what I wanted out of my next backpack. Chris worked closely with me to make sure every aspect of my custom pack was exactly what I wanted. 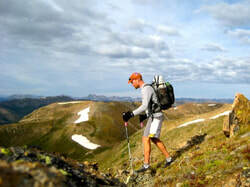 The pack was comfortable and well-made, and stood up to the rugged demands of the Continental Divide Trail. Whether I was traveling light or needed to carry 20 lbs of water, the stitching and materials never let me down. I look forward to using Zimmerbuilt packs for future hikes!"